Magnesium is important to many body functions, including producing energy and keeping your heart rate steady. This nutrient also helps form the compounds that make up your bones and helps regulate your blood sugar. A deficiency is rare, but if you have a risk for low levels, you should know the symptoms. Vision changes do not typically occur with a magnesium deficiency. If your vision changes, however, contact your doctor. It could indicate a serious eye condition. If you have a magnesium deficiency you may experience nausea, vomiting, weakness and appetite loss. In severe deficiencies, symptoms may include seizures, muscle contractions, tingling, changes in heart rhythm and changes in personality. A magnesium deficiency can also result in low potassium and low calcium in your blood, and your doctor can detect these with blood tests. A magnesium deficiency will not cause blurry vision, but other conditions may. If you experience gradual changes in your vision, it could indicate the need for a new eyeglass prescription, or you may have an eye condition such as cataracts or glaucoma. 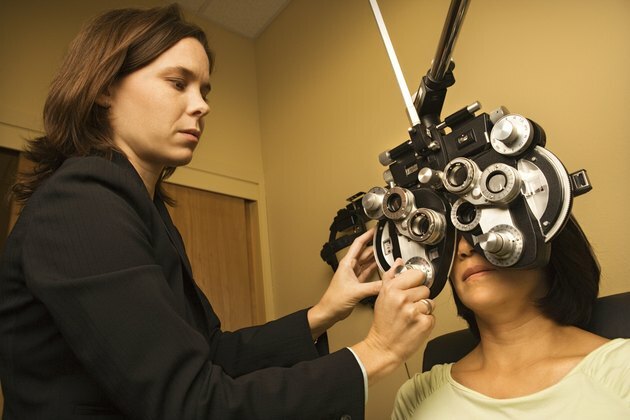 A sudden change in your vision could indicate problems such as a detached retina or macular degeneration. Dry eyes, eye infections or inflammation inside your eye may also cause blurring. There are vitamin deficiencies that can cause vision changes. Your doctor can tell you the appropriate amount of magnesium you need each day, since this may vary from person to person. An average adult needs between 310 mg and 420 mg of magnesium. Foods that can provide magnesium include brown rice, which contains 86 mg, and 100 percent bran cereals, which provide around 93 mg of magnesium. Other foods include bananas, spinach, lima beans and almonds. Most people get enough magnesium through diet, but your doctor may recommend a supplement to ensure you have enough. If you experience vision changes, contact your doctor. She can examine your eyes and perform any testing necessary to determine the cause for the blurriness. If you suspect that you may have low magnesium levels, inform your doctor. Explain your symptoms and report any changes in your eating habits and food choices. Can a Vitamin B-12 Deficiency Cause Eye Floaters?